There are few bags which embrace the winter weather ahead like this snowflake purse from Ralph Lauren. This knitted handbag is crafted from a blend of wool, mohair, and a touch of nylon. This wintery finish is paired with high quality leather trim on the sides and base. A leather strap is threaded through golden grommets to create a casual drawstring. Long tassels at the end of the tie bring a little flair to this relaxed closure. It's crafted from superior fabrics, yet this purse falls short for me. Honestly, it looks like the sort of kitschy design we'd see on a Bridget Jones Christmas sweater! It's not all bad news though. I like the lack of obvious labeling, but that may disappoint die-hard Ralph Lauren fans. The leather trim of the interior zip pocket is stamped with RLFC, but that's the only bit of branding. This Ralph Lauren snowflake bag is definitely not a purse for all seasons. While it could be a conversation starter at your next Christmas party, expect it to gather dust during the rest of the year. 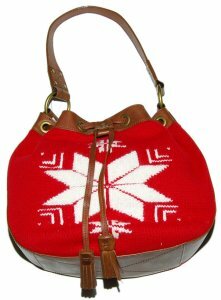 The Harajuku Lovers Dreamy Music Snowbunnies bag, a great alternative to this winter bag.